Many People have hyperpigmentation discolorations with their skins for many reasons. 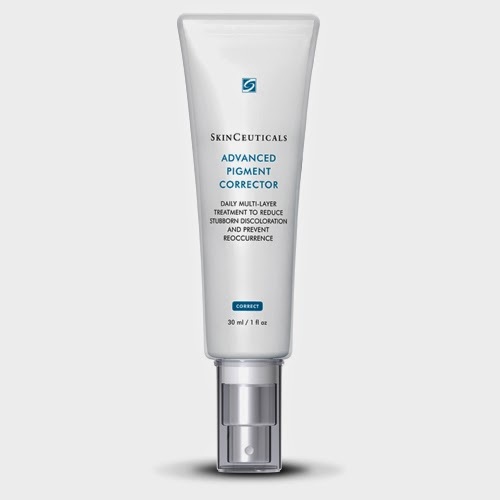 Overproduction with melanin is a major reason, and their are a lot of great skin brightening products, one being SkinCeuticals new Advanced Pigment Corrector. Miss Violet noticed that some reviews on the SkinCeuticals site were poor, however if you read them, they were hoping for reduction of acne scarring, not melanin... tsk tsk, this is about melanin and clearly noted. Used for all skin types, the pigment corrector will not only correct but prevent melanin from overproducing on the skin. This leaves the skin with an even skin tone, reducing the age spots, a great product for skin lightening. .3% Salicylic Acid – Will exfoliate, and penetrates deep into the skin to allow the other ingredients to go deep. .5% Ellagic Acid – Powerful antioxidant found in cranberries and raspberries. What is all the hype with Hydroquinone?